Yesterday NASA released a nifty photo of Jupiter's largest moon, Ganymede, immediately before Ganymede seems to disappear behind Jupiter. Ganymede makes a complete orbit around Jupiter every seven days, but because Ganymede's orbit is tilted, from Earth's perspective, it looks as if Jupiter's moon passes in front of Jupiter, then disappears behind the "dark side" of the massive planet, only to reappear again later. Ganymede is not nearly as tiny as the image would suggest. In fact Ganymede is larger than the planet Mercury, but Jupiter is so huge that it dwarfs Ganymede, making the moon seem tiny even though it is the largest moon in the solar system, larger even than Earth's own satellite. It's a lovely sharp image; well, actually, it's a color image that's made by combining the data from three images shot by the Wide Field Planetary Camera 2 using red, green and blue filters, thus creating an image that shows both Jupiter and Ganymede in colors very close to reality. The images were taken on April 9, 2007, but the combined image is new. 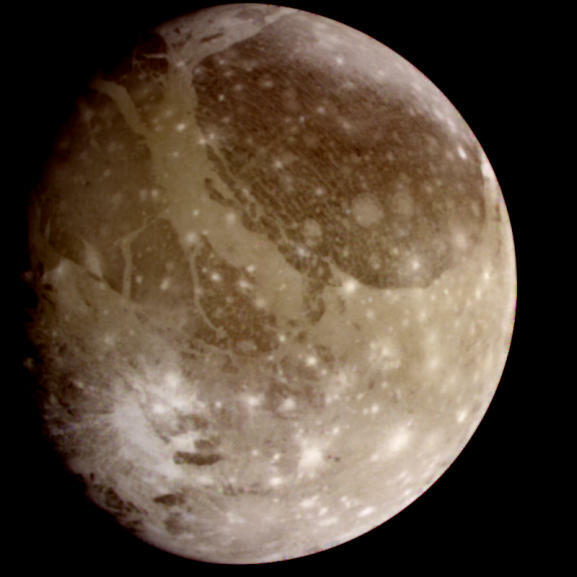 Ganymede, as you can see in this image of the icy moon taken by NASA's Galileo, has had a rough life. The lighter pock-marks are craters, some of them from relatively recent impacts. Jupiter's four larger moons, referred to as the Galilean moons because the Astronomer Galileo first made note of them, are all visible from Earth with mid-range telescopes. You'll notice the now familiar "Great Red Spot" of Jupiter's Southern Hemisphere on the upper left of the image of Jupiter. It's actually a long-running storm, one that astronomers spotted well over 300 years ago. The Spot has changed shape and size over time, as you can see from this collage of Hubble images taken between 1992 and 1999. The Spot is huge. The largest known storm in the Solar System, it has a diameter of 15,400 miles; that's roughly one-sixth of Jupiter's diameter, and close to twice the size of Earth. NASA also released a very short video made from the same data. It shows Ganymede slipping behind Jupiter as the planet rotates. The video was made by creating frames from images taken during a two hour period on April 9, 2007.